To reduce IGF-1 levels, there are several actions we can take. Besides omitting these types of foods from our diet, studies have also found that we can rapidly reduce IGF-1 levels to a normal state with a short 3-day water fast. Upon these levels dropping, a number of repair genes are activated and begin to heal the body from the inside. You can watch Michael’s entire journey and transformation here. A scientist named Valter Longo, featured in the BBC documentary above, is a Gerontological researcher at The University of Southern California. He and his colleagues have shown that fasting eases side effects of chemotherapy, and promotes health advantages to the body. His team found that reducing the amount of food in middle-aged mice for two 4-day periods each month actually allowed those mice to outlive their peers by about 3 months. They also saw that those mice were 45% less likely to develop cancer and their insulin levels were 90% lower. These mice were still able to retain their mental ability and beat the control animals in two kinds of memory tests. Here is a great video that explores the difference of when you reduce your caloric intake, versus cutting out food entirely. ld to completely obsessing about food. They only thought about food and exhibited neurotic behaviors like hoarding cookbooks, and even eating rotten vegetables out of desperation. Dr. Jason Fund, a Toronto physician explains that reducing your caloric intake actually results in more difficulty losing weight, making it easier to lose more lean muscle mass. Those who do this are generally in a constant state of hunger. 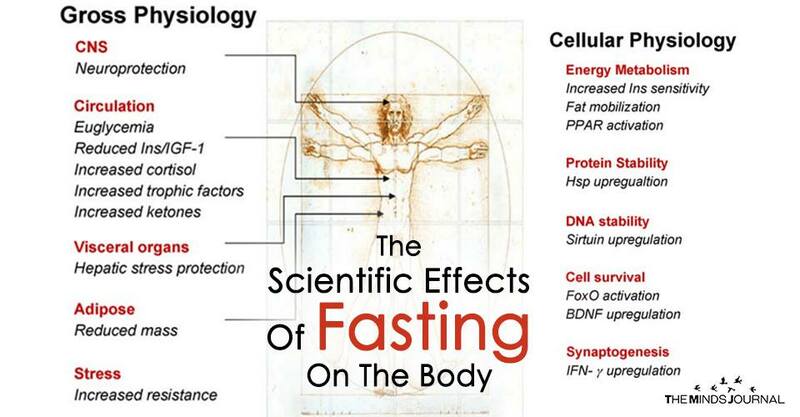 However, while fasting, you are only hungry for the first few days during peak periods (usually the times when you normally have breakfast, lunch, and dinner), before the sensation completely disappears and your energy levels stabilize. This is due to the amount of Ghrelin in the body. Ghrelin, also known as the hunger hormone is responsible for the feeling of hunger and weight gain. Generally, ghrelin levels spike in the morning, at lunch, then dinner time because our bodies have been programmed to expect food at that time. A study conducted at Aarhus University Hospital in Denmark found that in the first 84 hours of fasting, ghrelin levels continually decreased. Typically after the first 3 days, hunger disappears altogether.